Hi my friends, I have some great news and some sad news ... GREAT NEWS is Mimi, our awesome Blog Owner, is going back to college.. so happy for her. So for that reason, Challenges 4 Everybody will be taking a rest for a while until perhaps January and we may at that time start up again. I am certainly going to miss our challenges here, we have had an awesome design team and Mimi is the greatest, a real sweetheart. So as said, this is our last challenge and here is my final card. You have to make a card surrounding the theme of our blog, so you would have to use our blog colors, text styles, clouds, branches and ladybugs. Oh, please, don't forget the LADYBUGS! So here is what I used to make my "Blog" card. Cardstock was from my stash. The flower branches and birds are from Jolie's Boutique. I printed the sentiment and used Stampin' Up Punches. 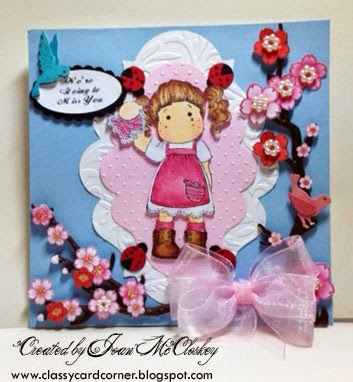 I also embossed the matting behind the image with Sizzix embossing folders. The image is a rubber stamp from the "Magnolia Collection. I made my ladybug card corners using 3 different size circle punches and just nipped a section to make the wings and a few dots with my black marker... Voila! So this is a really easy card to make with all your scraps just using the colors needed. just don't forget the Ladybug.... it's our favorite and they're good luck!! So as it brings "Good Luck" get your card entered because our Mimi is giving away Special Badges!! Yes, she is!!!!! Just Awesome!!!! I would like to thank each and everyone of you that joined our challenges. You have made the blog a huge success, just absolutely awesome with all your creations. Thanks from the bottom of my heart. Please keep a watch here as when the time comes to start up again you will be the first to know!!! P.S. During our silent time here I would like to invite all of you to join me over at Through the Purple Haze. I am on the design team there and they are a great fun loving group of ladies. Check out our current challenge. Great prizes too!! Also, I would like you to check out Sunshine Mail. These challenges are for children who are ill, some terminally, homeless, fostered and love receiving mail. You join in the challenge according to the theme, make your creation and then MAIL IT to Sunshine Mail and it will be given to one of the children. I love putting SMILES on their faces. Check out their blog too and see how you can help. If you have any questions just let me know as I am a DT member there also. Ladybug, Oh Where Are You?